It’s a good idea to start with what to look for, when considering the purchase of a new Meerschaum pipe. High-grade Turkish Block is still being carved, while African Block pipe production ceased when the mines shut down in 2006, so I will start with Turkish Block Meerschaums. The first and most important aspect of pipe selection is the quality of Block that the pipe has been carved from. The high grade Block is found in the deep mines, at depths of 200 feet or greater in the clay around Eskisehir Turkey. It is very porous and can be very light in weight, although some Block is dense and weighs more. It has a creamy, translucent quality to it. You will know it when you see it, even for the first time. It doesn’t look like chalk or have inclusions that make it heavy and reduce it’s properties of heat dissipation and absorption. Lesser grades of Block are found closer to the surface, often mined using modern techniques. Pressed Block is made from Meerschaum chips and dust mixed with a binder and pressed into a workable form. It is a poor choice. It pays to deal with reputable sources and avoid ‘bargains’, as easily 80% of the pipes found on the internet are of poor quality. If you’re shopping at a Brick and Mortar store, you have the opportunity to carefully examine the pipe. If you wet your finger and rub it on the inside of the bowl, high grade Block will readily absorb the moisture, while low grade Block or Pressed Meerschaum will not. If you’re looking at a pipe on the internet, it’s good to know the pipe’s dimensions and weight. Avoid Sellers with whom you cannot establish a dialogue, prior to any payment. Reputable Sellers are happy to answer questions. It is unwise to deal with those who are evasive or profess to have little knowledge of what they are trying to sell you. No amount of craftsmanship can make up for poor quality Block. African Block pipes are still in the supply lines currently, but they are selling for many times what the original prices were, because they are no longer in production. African Block is heavier and doesn’t have the same degree of absorptive properties as Turkish, but it is a good choice for those who want a sturdy pipe that smokes well. I’ll deal with the estate Meerschaum pipe market in another article, as it requires more knowledge and experience for the Buyer to have a good result. Learning about acquiring new Meerschaums will provide a strong base of knowledge to make good choices, so for now this is a good start. Some are drawn to the Figurals, while others prefer more traditional shapes. Either way, it is important to consider the draft of the pipe. The more recent pipes, like IMP and Fikri Baki’s Meerschaums employ a bit-to-shank connector, where like a Briar, the tenon is incorporated into the bit, while the mortise resides in the pipe’s shank. This is starting to see wider use by a growing number of Carvers, while the older Teflon push/pull connectors are being used less frequently. The result is a more open draft in comparison to the restrictions of the Teflon push/pulls or bone screws. I prefer an open draft so that I can have control over the burn according to how I pack and tamp the load. As I have pipes with all of these connectors, I’ve learned how to get a good smoke out of them all, but then again I’m from an old school line of thought. 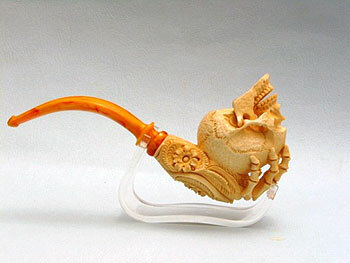 Meerschaum pipes are handmade, so each is a bit different from the last. The best Carvers use the best Block available to them, which is subject to a supply line that ebbs and flows. Not all pipes carved by a Master Carver are perfect, but it will be the best he could do with the Block he had at the time. Sometimes, the limitations of the Block present a challenge to the Carver that he must overcome by both skill and craftsmanship. I think that these pipes show the genius of the Carver over the more symmetric results from Block with fewer limitations. These pipes are ones that the Carver will put his name on, while the more flawed pipes and the products of apprentices go out as either no-name pipes or in as lesser grade pipes. While Carver specific pipes with hand cut bits are preferred by some, a good pipe can still be acquired within a limited budget, which is why it is good for the neophyte to stick with reputable dealers, where reputation is more important than the sale of any pipe. 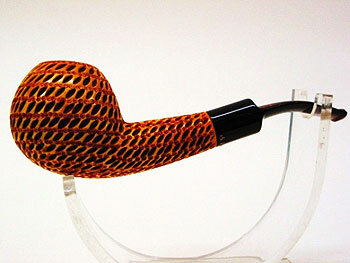 More experienced Master Carvers are accomplished at draft construction in a pipe. 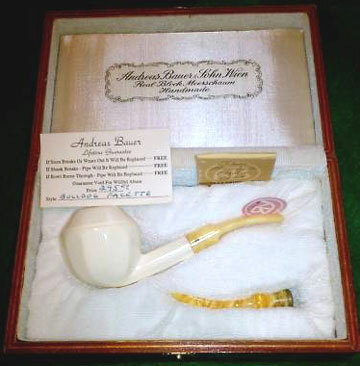 Drafting preferences of the Buyer can vary, so commission Meerschaums offer the choice for the Buyer, if a suitable pipe cannot be found in the marketplace. Draft depends upon a properly well drilled Block and the choice of connector used by the Carver. Bits are made from Acrylic, Vulcanite, Ebonite, Amber, Horn or Lucite and can either be hand cut or production produced. Not all Carvers are skilled in bit construction. Some will allow a pipe cleaner to pass, without removing the bit, while others will not. It’s important to know that there is no school for Meerschaum Carvers and information exchange in the Meerschaum Community is unlikely, so it can take awhile for a Carver to become accomplished in this aspect of Meerschaum pipe creation. It is to your benefit to take these considerations into account when shopping for a new Meerschaum. 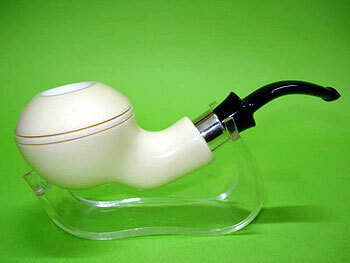 The variety of shapes in Meerschaums is huge and certainly relevant to personal choice in selection of a pipe. Size is also important and needs to be considered by the Buyer. The Carver is working to create the largest pipe possible from the Block he has at hand, as larger pipes bring higher prices and high grade Turkish Block is pricey. If you are buying from an online source, you need to know the dimensions and weight of the pipe, or you could wind up with a very small pipe. If you are having a pipe made, then it is important to specify dimensions, grade of Block, weight limitations, type of connector to be used and the bit style & material to be used. The form fitted case is good for protection of the pipe and to serve as a pipe rest when in use. If you are going to get a Meerschaum, it will not be a great pipe unless you smoke it, and to smoke it, you must be comfortable with it. Your budget will guide you choices, so get the most for your investment and it will provide you with years of smoking pleasures. The most discussed topic about Meerschaums is about the development of Patina. Coloration that comes from smoking and waxing a pipe produces the best result and is a lesson in delayed gratification. It’s why many get involved with Meerschaums and likely the reason they give it up. The reason I stay interested in them is that they smoke wonderfully. Yes, I enjoy the evolution of Patina and it really can put on quite the show of colors from Flamingo Pink to darker shades of Red, Brown, Gold and eventually to a deep Blue/Black. There are a number of theories about how this occurs, but I’m not aware of any scientific study in this matter. 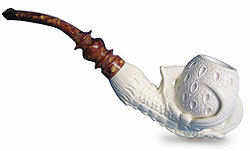 Meerschaum… For centuries, these stone Pipes have held sway among Pipesters fortunate enough to smoke them. Sages of Fire & Tobak, they share their lessons learned at each encounter in both visual and tasteful experience. Like us, they continue to evolve. Products of the earth, we reap the rewards in the junction of ages past and the flower of recent bloom. This White Mistress offers company through the Blues and joins in celebration of Bliss. In that part of me, where words fail, she waits. It is the Meerschaum Experience that I have chosen and one that I continue to learn about, as I see myself as a student of theses ways and customs. There is an abundance of information available beyond the conjecture most commonly passed along as fact. There are a multitude of choices to be made which, like all things hinge on preference. I’ve made many of my choices, which I do not offer as the guiding light for others, but simply the passion of my own experiences. The celebration of the Pipe is a topic that is dear to me. For me, as with others, it is the road less traveled that offers the experiences I seek. It’s not just the variety of a large open rotation, where blends provide counterpoint to each other, but the realizations that come from the familiar - the evolution that time brings with participation. Whatever blend I choose to burn in a Pipe in that principle of moments, gives me what I can appreciate at that time - which cannot be held in memory any more that I can catch light in a jar. Yet it is my feeble attempt at this memory that keeps me coming back to find what I remembered and more. As I evolve, so do my Meerschaums and the blends I smoke. The smoke can be as familiar as an old road that takes an unexpected turn, or a totally new event that makes me wonder why I didn’t get it before. I’m partial to blends of complexity. Every good blend should tell a story where the only regret is in it’s ending. I find that memory can pale, as the ash left in the bottom of the bowl. The magic lies in the moment. Yes, it is the memory that brings me back to that place where words fail - the Pipe, the tobacco and the fire. The process is heat driven and the Beeswax serves to provide migration routes for the byproducts of the smoke - a migration that moves both towards the outer surface of the pipe and back into the interior of the Block. The simplest method of waxing a pipe is to rub refined Beeswax on the pipe as you smoke it and allow the Block to absorb what it can. What is not absorbed should be buffed off with a clean white cotton cloth. There is a lot of discussion on whether or not the bowl should be handled. This is another choice that is up to the pipe smoker’s preference. I subscribe to the old school that says handle the Block as little as possible, especially when it’s hot. 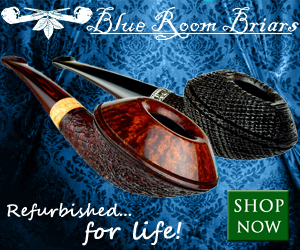 Some choose to handle the pipe as they would a Briar. It’s best to do what you feel comfortable with. I also choose to routinely clean my Meerschaums after every smoke. I use Everclear, shank brushes, plenty of pipe cleaners and keep cake buildup to a minimum with a sharp, blunt tipped knife. Others will put no effort into cleaning their pipes. One thing that is worth mentioning is that a Meerschaum can develop a black tarry coating inside the bowl, which will impart a bitter quality to the smoke. This is a good reason to keep cake buildup to a minimum. Avoid sudden and extreme changes in temperature as this can crack the Block. These are the basics about Meerschaum pipe selection and care. 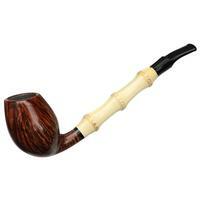 Reputable sources include: IMP, Altinok Meerschaums, SMS, Deniz Ural’s Best Meerschaums and Servi. For those who desire high grade Carver signed pipes, these Master Carvers are among the best: Sadik Yanik, Fikri Baki, Sevher, Xural, Tekin, Baglin, Segvet Gezer, Medat Kera, and Ergodan. If you’re thinking about getting a Meerschaum, enjoy the hunt. It you already have one, then start smoking it. These pipes can provide a wonderful smoking experience and should be something that you can expand your experience with, if only for a change of pace. Thank you for the report…it will come in hand. This is a fantastic article Fred! Informative, well organized, and a wonderful reference source (and oh, those lovely pipes!) I can’t wait for future contributions and feature articles. Thanks. Excellent article. It was a great read. Now I will be much a smarter consumer, the next time I venture out to acquire a new Meerschaum. Anyone looking for a quick rundown on the basics of Meers and some useful advice would be in luck if they found this first. Great article with a lot of information Fred! I really like the look of the Yanik Tomato Lattice. put it together and the cast of Carvers is top shelf. Thanks Fred. I have a couple of Meerschaum pipes that I bought from a Turkish Market in Mosul Iraq. I have smoked from one of those, and the other I haven’t. I enjoyed the smoke from the one, but decided to leave the other for a special occasion. I would never give up the two I have, but I wish I would have had the opportunity to read this article before. This article made me question if I had bought good quality or not…lol…oh well, they are connected to a part of my life that will never be forgotten. This article made me question if I had bought good quality or not…lol…oh well, they are connected to a part of my life that will never be forgotten. That’s what will make them give you pleasure for years to come! Thanks for the great article on Meerschaums. I recently brought an unsmoked 1996 CAO Ismet Bekler Meerschaum. The pipe is wonderfully carved and signed. I am not sure I did the right thing buy smoking it as it truly is a work of art. But needless to say, I loaded up the bowel and enjoyed many since. 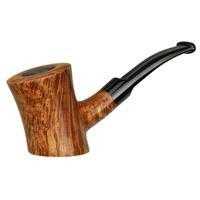 I had found that with this pipe I can switch and enjoy many tobaccos. Unlike my briars this pipe lets me enjoy a variety of tobaccos. I am not in the process of waiting to see how it colors and I try to avoid touching the bowl as much as possible as the article stated. This was a great article and thanks for sharing it with us. 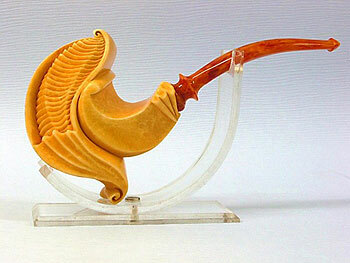 Fred, great job, I only smoke meerschaum pipes, like you I have several in my collection and enjoy them all. Had a great smoke this evening on a meerschaum, love them! Have many in my pipe collection. Great article very informative. A very informative article, Fred! 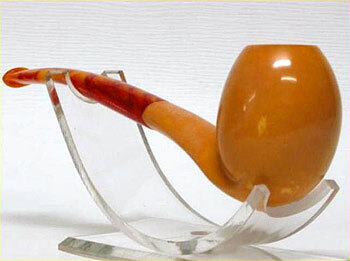 I have a question about a meer pipe type that is not seen much anymore: the leather covered meer. 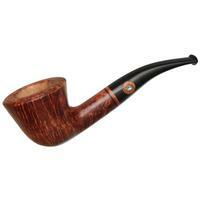 Usually a standard billiard shape, the meerschaum is covered with a tight, sewn-on sheath of chamois or other leather, supposedly to avoid touching the exposed surface of the pipe, allowing it to color better. Do you have any experience with this type? Does it “work” as intended? I have all but given up trying to color my two figural meers by not touching them while smoking, which is very unnatural. I am wondering if a leather-covered meer like I described would be the answer. It’d be good if you posted a link to your lovely meerschaum collection as shown in your albums on SF. the chamois had migrated into the Block. are on SF in my albums. experience will benefit many in this Forum! Thanks for the great and very informative article Fred. We are all the wiser for your knowledge. We now have a good idea of what to look for in shopping for meers. I’ve collected and enjoyed meerschaums for a number of years though I’ve kept my collection small for good reasons, cost and available space. I now have 21 in my collection plus two calabashes and enjoy each one. Almost all are figural as I enjoy the beauty of the carvings. I must confess that I don’t give them special treatment other than those you mention. I will confess that I once wore a cotton glove while smoking them but gave this up years ago. Great article. I bought my first meershaum (a Peterson) in the early 70s and still smoke it today. Can you give me some advice about properly caring for these pipes. Mine has a dull golden finish now but I admired the bright glow of many of yours. This is the first artical that I’ve ever read reguarding the meerschaum. I had alway’s thought they were strictly ornimental. Thank you for the input. thezman. Nice article, thanks Fred. I love to read about anything involving “Meerschaum” and pipes. I was most interested in the Mortise/Tenon part of the piece, but most informed by the African block part. Some little typo below… SEVKET GEZER is the correct spelling. 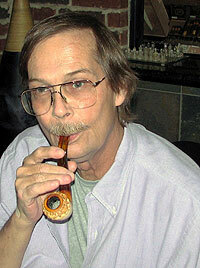 He is the MASTER Carver of My Preference, and the Creator of my Favorite pipe! While at university, I smoked a pipe for a few months and looked like a damn fool. Now, at fifty-one, I don’t look like a skinny geek trying to impress someone (and who in hell would be impressed by an eighteen year old pipe smoker?). So, I’m going to buy a pipe, pack it, light it, and enjoy the hell out of it. Cancer be damned! Thanks for the article. Well done. Great article Fred! I got my first meerschaum in Vienna in the summer of 1967. 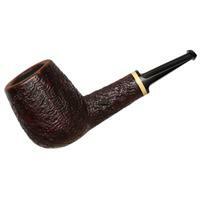 Being a poor student then, I had to settle for a pressed meerschaum billiard with a faux amber (acrylic) bite, that nevertheless over the years acquired a nice and interesting mottled patina and smoked real good. If you’ll remember, meer’s were quite epensive back then, even the lowliest ones. 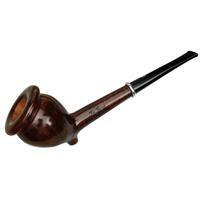 Later in life, as a young startup, I could add a Barling bent apple crafted of Rhodesian meerschaum. This is still one of my favorites. In recent years, I’ve had the good fortune of comissioning some specially carved, top grade block pieces from Sinan Altinok, as well a few from his quite nice array of standard carvings. Alktinok pipes smoke sweetly down to the heel, develope a fast even patina and are sure to elicit curious enquiries wherever I smoke them, although the most elaborate pieces I reserve for my living room. In any case, for any one considering a fine but affordable meerschaum, you can’t go wrong by visiting Sinan Altinok’s website. Forgive the plug, but I speak from satisfaction. Happi smokes! –Jorge. This is a wonderful article. As a young pipe smoker, I’ve always been fascinated with Meerschaum pipes. I remember seeing my friends fathers Meerschaum pipe, which was carved to resemble Plato. Ever since that day, I always wanted to invest in a meerschaum pipe. The craftsmanship seen in said pipes is stunning, making them almost more art-like than a tool. Hopefully, now armed with the facts from this guide, I will buy a Meerschaum. We received a donation of a meerschaum pipe and are trying to trace it’s origins. It is a small pipe in a fitted hinged case. it has caring of horses on it and the label on the inside of the case says N.P.W, Genuine Meerschaum. I found a listing on another site that indicates NPW was or is a company or individual between 1800-1925 of US origin. Would you know anything about this company or individual? Second or third time I’ve read this article, thank you for referring me back to it Fred!